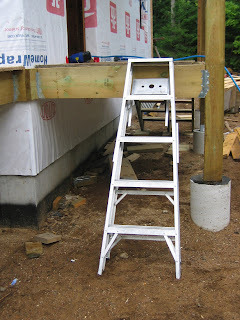 Cottage on the Edge - the DIY Cottage Blog: Stairway to Heaven! Up to this weekend getting up into the Cottage was either a running leap onto the front porch or using the small step ladder as a makeshift stairs up to the porch. Both or which were difficult when you are carrying tools or materials. ... Plus using a step ladder like this isn't exactly the safest way to use a step ladder - they even print warnings all over the step ladder to this effect. So I broken down this weekend and built a set of temporary stairs. It was quite easy really! I cheated a bit by first buying a set of pre-cut stringers - three in fact. Stringers are the supports for the boards that are used for the steps themselves. My my quick and dirty steps have six steps, and except for the pre-cut stringers were made from strap lumber I had. I made the steps 36 inches wide using a combination of a 2x4 and a 2x6 for each step. Scrap wood was used to level and support the bottom of the stringers, and I secured the tops of the stringers to the beam of the porch using a few 3.5 inch screws for each. 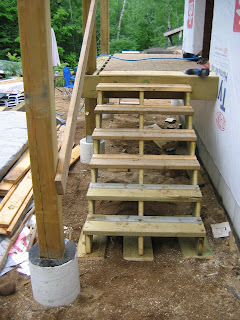 With another piece of scrap lumber secured to the posts at about 36 inches, I have a completed stairway. And it only took about an hour to do it. That is the second reason. My Dad is 8 months short of being 80 years old, and while still quite active, I thought having the stairs would make his tour of the cottage so much more enjoyable.